PADANG SIDEMPUAN - The Directorate General of New Energy, Renewable and Energy Conservation (Directorate General of EBTKE) of the Ministry of Energy and Mineral Resources (ESDM) again handed over the Solar-Street Public Lighting (PJU-TS) which was built using the APBN 2018. The ESDM Ministry represented by Head of the Geology Agency's Coal and Geothermal Mineral Resource Center, Iman Kristian Sinulingga handed over 175 units of PJU-TS spread across the city of Padang Sidempuan, North Sumatra Province to the City Government witnessed by Chairman of the House of Representatives Commission VII, Gus Irawan Pasaribu on Sunday ( 3/2). Iman reveals that the Solar-Street Public Lighting (PJU-TS) is a street lighting lamp that uses sunlight as a source of electrical energy. The presence of Solar-Street Public Lighting (PJU-TS) is a solution to be used on roads in areas that have not been reached by PLN electricity or in areas that have been electrified by PLN, but want to reduce the electricity consumption of the region. However, not all regions have been allocated the construction of Solar-Street Public Lighting (PJU-TS) due to limited budgets. Determining the location of the Solar-Street Public Lighting (PJU-TS) construction in the order of entering the application for the construction of Solar-Street Public Lighting (PJU-TS) infrastructure. "For North Sumatra, Solar-Street Public Lighting (PJU-TS) is allocated for 900 points, in 8 (eight) cities / regencies. 175 Solar-Street Public Lighting (PJU-TS) units for Padang Sidempuan City are spread throughout the sub-districts, the amount is included in the 2018 budget ceiling," said Iman. Padang Sidempuan has seven sub-districts and 58 villages. Padang Sidempuan Selatan Subdistrict is the largest recipient of Solar-Street Public Lighting (PJU-TS) with a total of 63 units. Whereas the least beneficiaries of Solar-Street Public Lighting (PJU-TS) are Padang Sidempuan Subdistrict as many as 3 units. The construction of the Solar-Street Public Lighting (PJU-TS) is the proposal of the Government of each Regency. 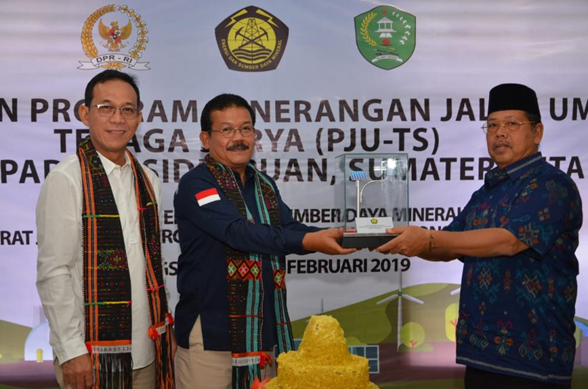 The construction of the Solar-Street Public Lighting (PJU-TS) in Padang Sidempuan is the initiation of the Chairman of the House of Representatives Commission VII, Gus Irawan Pasaribu. "Yes, on the initiation of Mr. Gus Irawan Pasaribu. But the initiation remains through the mechanism of proposals from the Regional Government to the ESDM Directorate General of EBTKE," continued Iman. Adding the statement of Iman, Deputy Mayor of Padang Sidempuan, H. Arwin Siregar said that the construction of the Solar-Street Public Lighting (PJU-TS) in Padang Sidempuan City is a form of synergy between the programs of the Central and Regional Governments that support the acceleration of development by encouraging economic prosperity in the community. 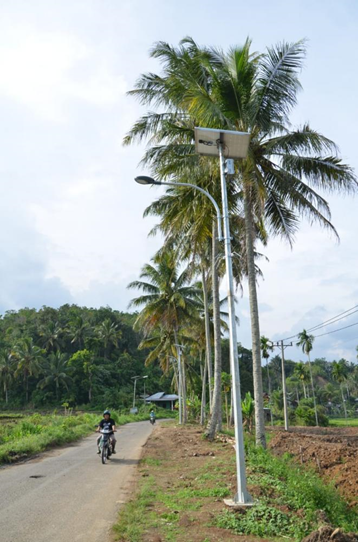 During a visit to the location of the Solar-Street Public Lighting (PJU-TS) in Rimbasoping Village, the Rimbasoping Village Chief, Mangarahon Siregar explained the benefits felt by the community with the presence of the Solar-Street Public Lighting (PJU-TS) in their village. "Previously on this road it was dark and even prone to crime. But after there was a Solar-Street Public Lighting (PJU-TS) it became bright and made us safe when doing activities and passing at night," he said. "My peoplecomplained to me after there was Solar-Street Public Lighting (PJU-TS) the street became bright and had many benefits. We hope this Solar-Street Public Lighting (PJU-TS) program will continue to a point that has not been reached," concluded Mangarahon.